This is “Managerial Skills”, section 6.6 from the book An Introduction to Business (v. 1.0). For details on it (including licensing), click here. Describe the skills needed to be a successful manager. To be a successful manager, you’ll have to master a number of skills. To get an entry-level position, you’ll have to be technically competent at the tasks you’re asked to perform. To advance, you’ll need to develop strong interpersonal and conceptual skills. The relative importance of different skills varies from job to job and organization to organization, but to some extent, you’ll need them all to forge a managerial career. Throughout your career, you’ll also be expected to communicate ideas clearly, use your time efficiently, and reach sound decisions. You’ll probably be hired for your first job based on your technical skillsSkills needed to perform specific tasks.—the ones you need to perform specific tasks—and you’ll use them extensively during your early career. If your college major is accounting, you’ll use what you’ve learned to prepare financial statements. If you have a marketing degree and you join an ad agency, you’ll use what you know about promotion to prepare ad campaigns. Technical skills will come in handy when you move up to a first-line managerial job and oversee the task performance of subordinates. Technical skills, though developed through job training and work experience, are generally acquired during the course of your formal education. As you move up the corporate ladder, you’ll find that you can’t do everything yourself: you’ll have to rely on other people to help you achieve the goals for which you’re responsible. That’s why interpersonal skillsSkills used to get along with and motivate other people.—the ability to get along with and motivate other people—are critical for managers in mid-level positions. These managers play a pivotal role because they report to top-level managers while overseeing the activities of first-line managers. Thus, they need strong working relationships with individuals at all levels and in all areas. More than most other managers, they must use “people skills” to foster teamwork, build trust, manage conflict, and encourage improvement.Brian Perkins, “Defining Crisis Management,” Wharton Alumni Magazine, Summer 2000, http://www.wharton.upenn.edu/alum_mag/issues/summer2000/feature_3b.html (accessed May 3, 2006). Managers at the top, who are responsible for deciding what’s good for the organization from the broadest perspective, rely on conceptual skillsSkills used to reason abstractly and analyze complex situations.—the ability to reason abstractly and analyze complex situations. Senior executives are often called on to “think outside the box”—to arrive at creative solutions to complex, sometimes ambiguous problems. They need both strong analytical abilities and strong creative talents. Effective communication skills are crucial to just about everyone. At all levels of an organization, you’ll often be judged on your ability to communicate, both orally and in writing. Whether you’re talking informally or making a formal presentation, you must express yourself clearly and concisely. Talking too loudly, rambling, and using poor grammar reduce your ability to influence others, as does poor written communication. Confusing and error-riddled documents (including e-mails) don’t do your message any good, and they will reflect poorly on you.Brian L. Davis et al., Successful Manager’s Handbook: Development Suggestions for Today’s Managers (Minneapolis: Personnel Decisions Inc., 1992), 189. Developing good time management skills is essential to being a successful manager. Prioritize tasks, focusing on the most important things first. Set aside a certain time each day to return phone calls and answer e-mail. 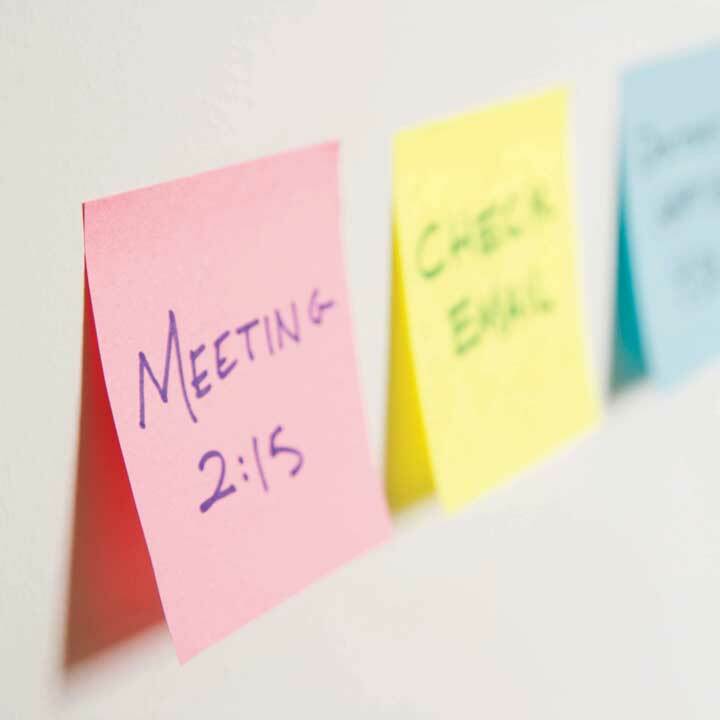 Insist that meetings start and end on time, and stick to an agenda. Eliminate unnecessary paperwork.Brian L. Davis et al., Successful Manager’s Handbook: Development Suggestions for Today’s Managers (Minneapolis: Personnel Decisions Inc., 1992), 189. Assuming that your top priority is salvaging your GPA, let’s tackle your problem by using a six-step approach to solving problems that don’t have simple solutions. 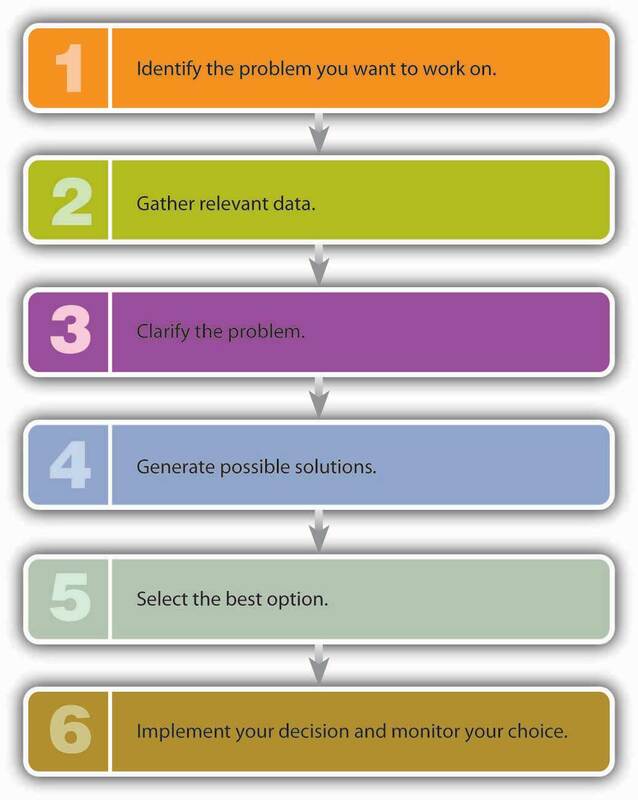 We’ve summarized this model in Figure 6.14 "How to Solve a Problem".Shari Caudron, “Six Steps in Creative Problem Solving,” Controller Magazine, April 1998, 38. Caudron describes a systematic approach developed by Roger L. Firestien, president of Innovation Systems Group, Williamsville, NY. Identify the problem you want to work on. Step one is getting to know your problem, which you can formulate by asking yourself a basic question: How can I improve my grades? Gather relevant data. Step two is gathering information that will shed light on the problem. Let’s rehash some of the relevant information that you’ve already identified: (a) you did poorly on your finals because you didn’t spend enough time studying; (b) you didn’t study because you went to see your girlfriend (who lives about three hours from campus) over the weekend before your exams (and on most other weekends, as a matter of fact); (c) what little studying you got in came at the expense of your team project and lacrosse practice; and (d) while you were away for the weekend, you forgot to tell members of the mountain-biking club that you had to cancel the planned meeting. Clarify the problem. Once you review all the above facts, you should see that your problem is bigger than simply getting your grades up; your life is pretty much out of control. You can’t handle everything to which you’ve committed yourself. Something has to give. You clarify the problem by summing it up with another basic question: What can I do to get my life back in order? Generate possible solutions. If you thought defining the problem was tough, wait until you’ve moved on to this stage. Let’s say that you’ve come up with the following possible solutions to your problem: (a) quit the lacrosse team, (b) step down as president of the mountain-biking club, (c) let team members do your share of work on the business project, and (d) stop visiting your girlfriend so frequently. The solution to your main problem—how to get your life back in order—will probably require multiple actions. Select the best option. This is clearly the toughest part of the process. Working your way through your various options, you arrive at the following conclusions: (a) you can’t quit the lacrosse team because you’d lose your scholarship; (b) you can resign your post in the mountain-biking club, but that won’t free up much time; (c) you can’t let your business-project team down (and besides, you’d just get a low grade); and (d) she wouldn’t like the idea, but you could visit your girlfriend, say, once a month rather than once a week. So what’s the most feasible (if not necessarily perfect) solution? Probably visiting your girlfriend once a month and giving up the presidency of the mountain-biking club. Implement your decision and monitor your choice. When you call your girlfriend, you’re pleasantly surprised to find that she understands. The vice president is happy to take over the mountain-biking club. After the first week, you’re able to attend lacrosse practice, get caught up on your team business project, and catch up in all your other classes. The real test of your solution will be the results of the semester’s finals. So, what types of skills will managers at Notes-4-You need? To oversee note-taking and copying operations, first-line managers will require technical skills, probably in operations and perhaps in accounting. Middle managers will need strong interpersonal skills to maintain positive working relationships with subordinates and to motivate them. As president, because you have to solve problems and come up with creative ways to keep the business growing, you’ll need conceptual skills. And everyone will have to communicate effectively: after all, because you’re in the business of selling written notes, it would look pretty bad if your employees wrote poorly. Finally, everyone will have to use time efficiently and call on problem-solving skills to handle the day-to-day crises that seem to plague every new company. The skills needed by managers vary according to level. Top managers need strong conceptual skills, while those at mid levels need good interpersonal skills and those at lower levels need technical skills. All managers need strong communication, decision-making, and time-management skills. Look for courses (or course components) designed to strengthen communication skills, such as writing (or composition) or speech classes. Find out whether your college has a writing program. Check into nonacademic programs designed to strengthen communication skills, such as courses on interview techniques offered by the career services office. Find out how you can do some writing for the school newspaper or, if you’re a little more outgoing, how you can appear in theatrical productions. By following these suggestions, you should get a very good idea of what your college can do to help you develop both written and oral communication skills. Write a brief report detailing your findings. Do you ever reach the end of the day and wonder what you’ve accomplished? To succeed in management, you need to learn how to manage your time. The Internet is an interesting place to start. For many college students, surfing the Net takes up a lot of time that could be put to better use. How much time do you spend online, instant-messaging, shopping, playing games, blogging, or indulging in some other enjoyable but time-consuming activity? One approach to solving the problem of wasted online time is to apply the six-step, problem-solving procedure that we outlined in the chapter. Write a brief report detailing each of the steps that you take to solve the problem and implement a solution.